After much research and reading about others’ experiences, Ken determined that the border crossing at Laredo would be best for us. We could easily connect to the Pan-American highways that runs through the center of Mexico, and are often noted as the best and safest roads. Knowing this, we left Houston, and drove to Laredo the day before our crossing. Once again, we stayed at a Marriott and the kids spent hours in the pool. On the morning of the crossing, we woke early, packed the car, ate our last US breakfast where we didn’t have to worry about the quality of the food or water, and drove the 5 minutes to the border. Our crossing was so quick and easy that I wasn’t sure it actually happened! Before we knew it, we drove across the bridge and found ourselves on the other side of the Rio Grande River. No one even asked to see our passports! If only I hadn’t thrown away the remaining blueberries and opened box of crackers that morning. You're not allowed to take fruit, nuts or open containers of food across the border. However, I couldn’t bring myself to toss Grandma Sarah’s dried apples and the almonds which I’d read are a lot more expensive outside the US. Thankfully, I also kept the remaining half a loaf of bread which was much needed later in the day for our PB&J lunch. One look to the left and we saw a huge line of cars waiting to cross into the US where customs is much stricter. Immediately after leaving Mexico’s customs, we were nicely helped by a man giving us directions to the government building where we needed to get a permit for the car. This is only needed if one is driving outside the “free” zone which is about 16 miles from the border. After thanking him, he nicely asked for a tip, which gave us a good reason to use some of the remaining US coins in the ashtray. 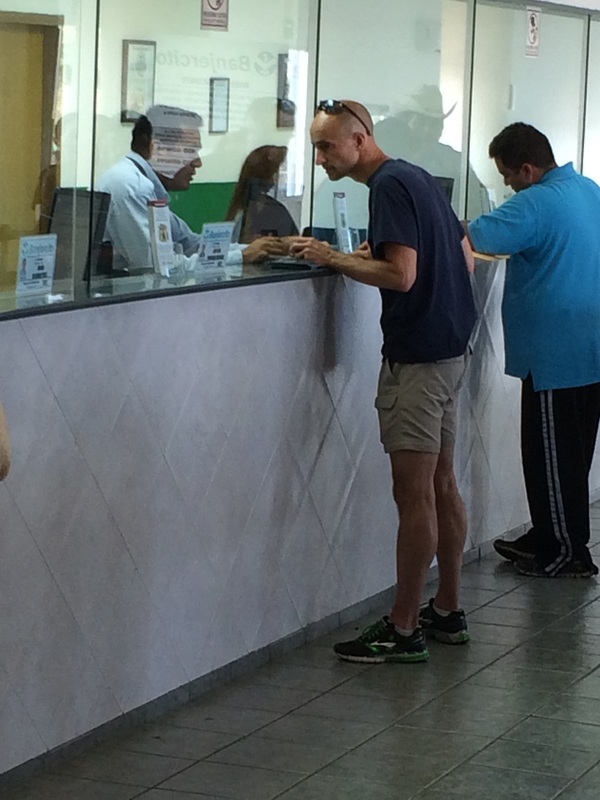 After finding the government building, and paying another tip, Ken grabbed our necessary paperwork (passports, documents showing our Mexican car insurance, car registration) and went inside. I remained inside the running car with the kids and the air conditioning. I felt safe the whole time, and realized everyone else had their windows down, cars off and were lounging around the parking lot, if not inside the air conditioned building. By now I’m feeling a bit guilty that the car is still running, and the kids had to use the bathroom. So, inside we go! Inside we easily found Ken in his third of three lines, and I took the kids to the bathroom. Oh, how I’d forgotten! In retrospect, it was one of the grossest bathrooms we would see all day, but then again we didn't have to pay anything to use it. There was a big roll of toilet paper at the entrance and we had to grab some before we entered the stalls. Later Ken had to use the same dispenser barely inside the ladies room so that he too could grab some! All men did this. Inside the stall, there were toilets with no seats or lids. Clearly we haven’t taken the kids camping enough because Elle isn't used to squatting. She got comfortable real quick! Next to each toilet was an open garbage can for used toiled paper and other bathroom paraphernalia. Outside the bathroom and between the communal sinks was a rusty tin with a bit of soap left on the edges and in the bottom. We used this to wash our hands and got out of there. While waiting for Ken to finish with the car permit and our Tourist permits (which are needed if you’re driving as far as we are), Tag ran around and made friends. A few Mexican kids were playing on handhelds which of course piqued his interest. He butted into their world, chatted amicably (none of which they understood) and pretty soon two of the boys were fighting for his attention. 2 hours after crossing the border, we were finally ready to hit the road. Sorry for the fuzzy picture. Here's Tag and two of his new friends. Since the border crossing didn’t take too long, we decided to drive all the way to San Luis Potosi, and not spend the night in Monterrey. This meant for a long drive with no time to stop for lunch. According to the GPS, we’d arrive around 6:30 pm, which only gave us 2 hours of spare time before it got dark. It’s our goal to arrive at our destinations earlier in the day so that we have more daylight hours in case something happens. However, knowing that we'd be on the good roads (toll roads) all day, we decided this was a good decision. More Bathrooms. We were able to drive straight through to San Luis Potosi with several bathroom stops. Many of these stops were at Pemex gas stations, they are owned and run by the country of Mexico and have safe, clean bathrooms. At one bathroom, an attendant made sure we had everything we needed (yes, she also handed us toilet paper) and we gave her a tip. At another bathroom, we put 4 pesos (about 33 cents) into a machine which then gave us access to the bathroom. Of course there was a nice attendant outside the gate offering change and he too received a tip. Later we found a clean bathroom with no attendant or access fee, but we had to put 1 peso into a machine which gave us toilet paper. We even tipped the men at one station that cleaned the car windows. At first we refused the service and quickly realized we were the only ones that did. Ken gave one of the men some more money out of the ashtray, and it was nice having a clean windshield. Unfortunately, we have a lot of US coins (we neglected to find a Coinstar machine in Laredo – dumb considering Ken’s last job), but now we know what to do with it. Even with all the bathroom stops, we arrived in San Luis Potosi at 6:30 to a very nice hotel. Holey Moley! We're now expats and that's very cool. Next up, San Luis Potosi.